this article is about that what matters more – the value. Every person values products and services depending on his/her values of life and everyone can create values for others. For example, the values of people we work for are time, family, full-filling life and success. Knowing that we put an accent on the excellent quality of work, efficiency and time saved for you. We think of you and your values all the time completing your requests, we get you the excellent results you even haven’t expected. This is the added value of our services, this is our philosophy that we apply in everything we do for the client: home management, event management, travel arrangements, relocation etc. Our service is a tool to your happiness. This is what differentiates us from other companies. 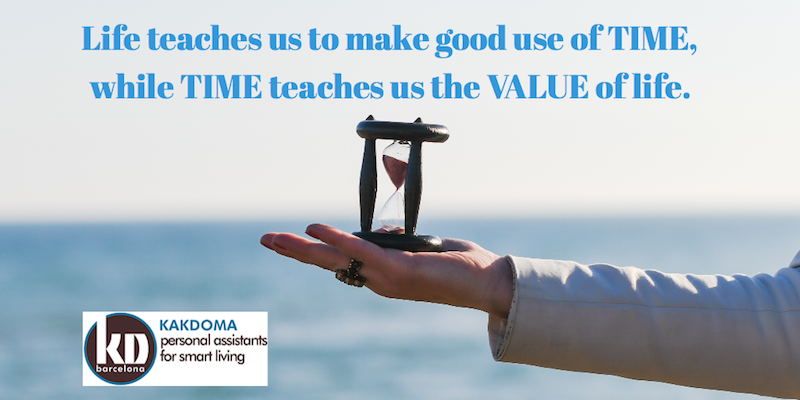 Time is priceless. You need to make the most out of it. Living an active life, dealing with so much quantity of available information, having “so many things to do” and trying to do that all by yourself, we get lost in everyday routine and forget completely about the value of time, we forget that life is not eternal… Stop for a moment, think about what is important for you and change your attitude until it becomes too late. KD team is here to help you to deal with the biggest change in your life and to make your everyday pleasant and productive. We believe that we can win more time for you and become one of those people, whose work results influence your daily life and brings important changes into the society. To help you to realise that, simply think about the items you use every day. Did you know that some of them are actually the fruit of Spanish inventors? Check out this list of inventions to learn more about how Spanish ingenuity influences your daily life! Blaise Pascal was the inventor of the first calculator, which worked with wheels and gears, but it was the Spanish civil engineer and mathematician Leonardo Torres y Quevedo who created the first digital calculator around 1914. This is another of the most important Spanish inventions. It was also invented by Leonardo Torres y Quevedo, who registered his first patent as “A system of funicular aerial road of multiple wires” in 1887. The first Torres Quevedo cable car was used for public transportation in Monte Ulía (San Sebastián) in 1907. Due to its success, this invention was exported outside the Spanish borders rapidly. For example, the Niagara Falls air shuttle was also invented by Torres Quevedo. Enric Bernat, the founder of the Chupa Chups lollipop company. Bernat got the idea of his lollipops from his getting sticky hands from melting sweets. In 1958 pioneering sweet-lover Enric Bernat created a universally appealing sweet that would make kids and parents happy: “a sweet with a fork”. Shopkeepers were instructed to place Chupa Chups near the cash register within reach of children’s hands, instead of the usual placement behind the counter. Although the Mayans and the Aztecs smoked tobacco by using different leaves as rolling paper, the Spanish were the first to manufacture the grandfather of the modern day cigarette. When tobacco first made it onto Spanish shores in the 17th century, maize wrappers were used to roll and then fine paper. Some of Goya’s paintings depict men smoking a papelete, as a cigarette was known back then. Spanish inventor Manuel Jalón Corominas saved us all from a lot of backache by coming up with the very useful mop, bucket and wring. Although there is evidence of earlier versions from as far back as 1496, it was the Rioja native who had the brilliant idea of having a way to rinse out the dirty water out of the mop in a more manageable way. Manuel Jalón, the inventor of the mop, also did many things for the healthcare industry. He created the hypodermic disposable syringe which meant a great advance in stopping the spread of diseases. Spanish lieutenant Isaac Peral was the creator of of the first electric battery powered submarine, considered by many the first U-boat. And catalan physicist Narcís Monturiol invented the first air-independent and combustion-engine-driven submarine. Juan de la Cierva was a Spanish engineer and aeronautical enthusiast who developed the first successful rotorcraft, or autogiro, in 1923. Similar to a helicopter in appearance, the autogiro was an aircraft that could fly safely at low airspeeds. If you’re interested to know more, here is the longer list of Spanish inventors and discoverers. There are other people from Barcelona that significantly contributes in development of the things in the areas of science, economy, business and others. Researchers at the Autonomous University of Barcelona in Spain have created a device capable of generating the first-ever ‘magnetic wormhole’ in a laboratory: a spherical device capable of transferring a magnetic field from one point in space to another. Nature Bissé company was born on June 7, 1979, entering the professional cosmetics market with five creams that targeted various skin needs. Its founder, Ricardo Fisas Mulleras, decided to dive into this thrilling business adventure after seeing how hydrolysed elastin and collagen proteins considerably improved skin’s texture. “Ricardo Fisas established his company on the foundational pillars of professionalism, effort, commitment, the ability to overcome and social responsibility”. Xavier Sala-i-Martin is one of the leading economists in the field of economic growth and is consistently ranked among the most-cited economists in the world for works produced in the 1990s. One of his merits (among many others) for which he received the Award “for its innovative, accessible and user-friendly approach to communicating the reality of Economics and Business”. Barcelona is a city where we receive good news from the startup world on a daily basis: a huge investment here, a notable award there. Read about new discoveries. The common thing between these facts is that people influence the society with their everyday work. Over time the hard everyday work creates important value for all people. A song can have a deeper impact than a few minutes of distraction. A comedian can do more than entertain. We know that the value Kakdoma Barcelona delivers to the world isn’t earth-shatteringly huge, maybe it seems small and simple now, maybe benefits just some business people and families we work for in a small way, but until it does (see the references) and does it everyday, we will keep doing it. We understand how stressful can be your day, because of the “many things to do” or “don’t know how to do it” and we know we can do more than just complete your requests. We can save your time!